Glenn Mitchell, the author of “The A-Z of Silent Film Comedy”, will show and talk about films from the less well known comedians, many of whom he regards as geniuses in their own right. There will be films of Charlie Chase, Billy Bevan, Alice Howell, Ben Turpin, Snub Pollard, Charlie Bowers, Al St. John, Lupino Lane, Lloyd Hamilton, to name just a few of these forgotten comic heroes of the silent screen. Charlie Chaplin was born in Walworth, not far from here. His father left when Charlie was only three, and he then lived at various addresses in and around the Kennington area with his mother Hannah for the next few years. 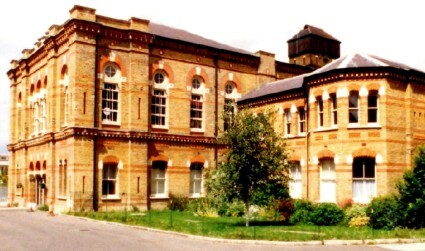 With two young children and no work she slid into destitution, and eventually the family were admitted to this site – The Lambeth Workhouse. The memories and stigma of the extreme poverty never left him. A hundred years ago to this day Charlie Chaplin left for America. The film historian David Trigg marks the event with a screening of “The Immigrant” – Chaplin’s take on what it was like to cross the Atlantic and start a new life. Chaplin made this in 1917; three years after his film career began. This will be accompanied live on the piano by Cyrus Gabrysch. David Trigg, will also show clips from other Chaplin films demonstrating how much the film star’s life in the Kennington area influenced his film making, even to the extent of having sets built based on his own London childhood. David points out that one even resembles the building that is now the home of the Cinema Museum, where Chaplin and his mother spent some considerable time. Graham Murray wrote and compiled around 500 editions of the popular film programme “Clapperboard” which ran from 1972-1982. Clapperboard was a programme about film history, and was presented each week by Chris Kelly. The series covered all aspects of film making and cinema history. Graham will show some clips of the programme plus a full 45 minute Bank Holiday edition of “Clapperboard”. Film historian Graham Murray was born in Liverpool and came to London in the late 1950’s. In 1959 he joined the film division of the government’s Central Office of Information, and then joined Granada in 1962. He has worked over the years on a large number of mainly archive film based programmes starting with “All Our Yesterdays” – which looked at our history through the newsreels. Film historian Gerry Turvey explains how the Phoenix Cinema in East Finchley (built 1910), featuring a later unique art deco auditorium has outlived rival cinemas, including those of the big chains. Moving from mainstream to art-house programming, then becoming a charitable trust and servicing North London’s local communities. Gerry Turvey’s illustrated talk is based on his new book The Phoenix Cinema, A Century of Film in East Finchley published by Phoenix Cinema Trust. Following its fortunes through the various name changes (Picturedrome, Coliseum, Rex, and Phoenix), physical transformations and programming policies that have helped it to endure and outlast its rivals. The wide-ranging account will describe the Phoenix’s construction in the 1910s, the introduction of orchestras and live variety acts in the 1920s, and the response to the threat from the super-cinemas of the 1930s, how it dealt with the decline of cinema-going in the 1950s, the introduction of ‘art-cinema’ films in the 1970s. The story of this unique cinema will be of interest not only to its past and present audiences but also to all those with an enthusiasm for local history, cinema history and twentieth century development in popular culture and entertainment. Other events taking which veer into the strange world of talking pictures include A Conversation with Julie Harris (7 October), A Conversation with Angela Allen MBE (4 November) and A Conversation with Burt Kwouk (18 November). And taking place at the Museum on 16 October is the annual Home Movie Day, London’s contribution to the international event promoting the personal film. Members of the public can bring in their home movies for inspection, projection and advice. More information on this from www.homemovieday.com/london.html. Finally on 18-19 September there is a weekend fundraising event, a film and movie memorabilia bazaar between 10:00 and 17:00, entrance price £5. There will be dealers’ tables with books, psoters, stills, films, equipment, campaign books, DVDs and more. More information on the and other upcoming events from the Cinema Museum site.